Although GVS is most well known for its' industrial strength hardware solutions it is, in fact, also a firmware developer/applications specialist for companies like Microsoft, Apple, and Sun. Beginning, years ago, with a custom mounting Nomadic Formats, Storage Sub System, Virtual tape archive, developed specifically for Nomadic II hot-swap storage devices, our engineers quickly expanded into other areas of firmware development. Today GVS produces the highest quality turnkey/workflow systems for the Broadcast, Government, Medical, Science, Military, Manufacturing and Publishing. Our more popular solutions include GVSAN, Tracker DDM, Virtual Archival System, and server based tools such as Re:View Manager, Automated Playback Server, PDF generation, and Nomadic Shuttle Systems. Virtual Tape Recorder Interface (INT) Simplified options of the GVS9000 VTR user interface provide ease of operation and control of the digital playback and capture. Just like a traditional tape recorder, the GVS9000 VTR provides very simple and clear control from local RS422 or remote location TCP/IP. The GVS9000 VTR lets you control multiple VTR units at the same time, with optional time display, audio level, and video bin for easy tracking and instant playback of all the clips at various speeds. It also allows users to set up specific time to start and end recording of content from uncompressed 2K, HD, SD to compressed SD resolution, with same user interface. Multi machine gang recording for multiple sources w/remote control. Interface control from local shuttle wheel via RS422 or TCP/IP, VDCP, P2 (Odetics extensions option) w/GPI option and timecode chase. Virtual Tape Recorder PRO (VTR Pro) Optional Recording feature for areas where users need to control multiple GVS9000 VTR's. The XML option for editing while the recording is in progress provides users the ability to preview footage during recording from multiple cameras. The Sony 9-pin deck control audio LTC capture allows on the fly subclips generation for later use in post. this option is ideal for Live events, Sports News, Telecine, Audio Post, Stereo Scope capture and play back in HD and 2K. Start edit during recording, ideal for live event. The unique capability of 9000VTRs is its ability to playback content that is continuously being recorded, with specific starting time. The playback can start 5 sec after recording begins and you can continually record material with automated options. Allows multiple 9000VTR's to be recording at the same time from one simple interface, small Pre:View of each channel, allowing he user to monitor all incoming feeds from single interface, multi channel automated record scheduling, with a router control option, allowing captures from specific sources to be scheduled in advance and automatically performed. MetaData can be entered for each capture from the single user interface and other functionality for multicam capture is included, gang roll, generating XML stack for edit on final clips. This option requires PROXI option with VTR-PRO to generate proxy files during recording. The proxy files can be accessed while recording with a number of Proxy code's options. When time stamping this capture, the system will use either LTC time code, 9-pin time code or the VTR Clock time, VDCP control for automation systems. Audio metering and arming panel. You can select which audio tracks to capture, and see basic level metering. Real-time preview on control monitor. GVS9000 VTR Remote controlled via RS422 and TCP/IP connection. This allows centralized control of up to 4 VTR's from one remote position. The VTR-PRO can be controlled to record, stop and mark XML either individually, or as group VTR's during recording. Film Proxy Generator (FPG) Ability to provide user in field ability to record real-time 2K, 4:4:4, 4:2:2, 1080i/p, ProRes, JPEG, DVCProHD uncompressed direct recording of digital content with multiple proxies file format generation. With The Proxy offers the identical clip time code and frame accurate duplication of your uncompressed recorded material. This content gets generated at the same time as you record your uncompressed content. GVS has developed the tools to allow building proxy files during recording of the clips with links to the original uncompressed material. The proxy can also be generated with compressed content, and doesn't require any additional time or processing power. Using the 9000VTR, just activate this option and select the media where you would like to have this proxy file stored, including portable USB sticks which allow you to move this anywhere in Windows, Unix or OS X environment. The key feature of 9000VTR with Proxy is the ability to stream the proxy files. If your project requires you to stream content over the web or intranet, then this automated system is already in place for you to take a advantage of. TV Vitalization Management (TVM) GVS successfully launched a number of TV stations with vitalization firmware providing the ability to offer entire archiving strategies in a file based environment for TV master control, Engineering, Traffic, Programming, IT and production. This enormously benefits TVM implementation, reducing the risk factor,and increasing the availability of content. With the smallest budget, and simple design structure you can expand the hours of content in a relatively short time window. With simple rule design users have various programming options from time to ingest and first play, time between first play and next play, how long do you have the rights to play, in a multicasts world how often do you repeat material on-air between primary and secondary channels, automated decisions based on simple rules, and dramatic change in time use of master control operators for recall of content. Re:View Manager has revolutionary document workflow capabilities Optimized for GVS' own Metropolis Server solution w/DAM, Re: View Manager is a fully cross-platform browser based production tool. Quark, Illustrator, PhotoShop, Microsoft, and other file types are converted and displayed on-line for local and remote viewing, soft proofing, annotating, and printing Re:View Manager is totally secure with multiple levels of password protection.The best part is, Re:View Manager documents maintain links to their original PostScript information so nothing is lost in the translation. The Workflow Tools Accelerate (WTA) Workflow tools accelerate your workflow by allowing your team automated generation and placement of Lo-Re's (FPO) or Proxies video images for layout and Web ready images for instant Web posting. The original version of these images is retained on the server and is located and placed automatically when the final documents are printed or output to film or Nomadic drive. Documents stored on the server can also be instantly converted to PDF or video file can be saved in number different Quick Time reference files with change of resolution for local or remote viewing and playback, soft proofing, annotating, and/or web posting for enhanced project collaboration. The Nomadic Shuttle Systems (NSS) With Hot/Swap removable drives, were originally engineered to allow graphics professionals the ability to move large files from one workstation to another, without incurring network bottlenecks. Although network technologies have improved (bandwidth) - greatly reducing the need for removable drives as a method of data transfer - they are still widely used, with GVS customer formatting firmware it allow's you to move your data from multiple different platform, OS X to Windows and other popper operating system. GVS Storage Sub Systems (SSS) Accelerate your disk intensive applications with the SSS. This blazingly fast disk I/O based hardware and firmware product will turn your GVS9000 workstation into a graphics monster. Video, audio, animation, graphics and other application will execute faster than you ever thought possible. SSS is ONLY available with the GVS9000 1U, 2U, 4U FreeBSD product line. 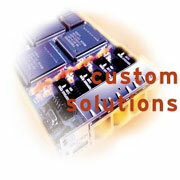 Although the GVS9000 SSS will not be sold separately, current owners of the GVS9000 workstation can request an upgrade. GVS is currently shipping the GVS9000 SSS in large capacity than before.